Who is Your Financial Independence Mentor? 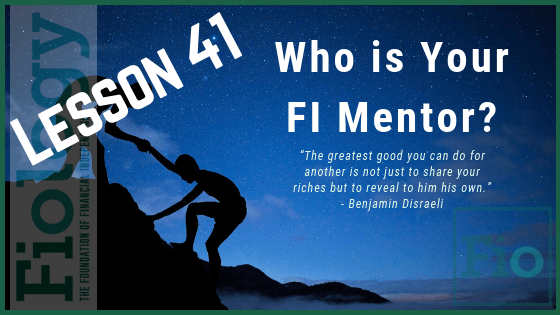 LESSON 41 : WHO IS YOUR FI MENTOR? Fiology thanks the Filosopher of the FI community, DocG of DiverseFI, for shaping this lesson. Discovering financial independence is magical. After tripping over a blog or listening to a podcast, change comes quickly. Most can plot major life reorganization in those first six months after deciding on financial freedom. Debts are paid. Assets are reallocated. Revenue streams are optimized. Some even start a side hustle. With what seems like a little work, you can set your life and goals on autopilot. And then you hit a roadblock. Those beginning steps are so easy, but you stumble on breaking through to what comes next. Better. Better is the state you continuously strive towards. But how do you get better after you accomplish the basic tasks set out before you? Is it time to consider a financial independence mentor? Coaching (or mentoring) is not a new concept. Back in 2011 surgeon Atul Gawande, in The New Yorker, described his use of a coach in the operating room to improve technique and outcomes. Like in athletics, the idea was to have an outside expert observe and critique performance from afar. Unchained by internal conflicts of interest and emotions, the mentor was able to point out unnoticed flaws in Gawande’s performance. His patients improved. Could a financial independence coach do the same for our bank accounts as well as our sense of contentment? Take Action: The idea of mentoring outside of the athletic arena has been slowly gaining speed. Financial independence, like any other hard-fought accomplishment, is rife with pitfalls both economically and socially. We could all use an experienced hand to guide us from time to time. Whether this ends up being a mentor or group of mentors, our community is full of smart people. Consider attending a local ChooseFI meetup or a CampFI. You will likely meet other people who are interested in and using some of the same tools and philosophies as you to reach Financial Independence. When you feel comfortable, reach out, begin dialogue, and learn. There is always someone out there who knows more and has valuable experience to learn from. Seek them out and you could propel your confidence and results. Watch: Becoming Financially Independent by Barbara Stanny of Wall Street Journal on YouTube. Thank you for the mention. I really appreciate being included. I also think it’s important to include MrMoneyMustache in this list. Before Pete came along us FI advocates/mentors were just an outcast group in the “retirement planning” category with non-conforming ideas. Pete’s meteoric rise in popularity did more to popularize FI than anyone else giving him a clear foothold in the mentor category for introducing so many people to the main principles. Absolutely agree. Pete has done an excellent job of understanding (creating?) the modern concept of FI, packaging it, and messaging it in a matter of fact tone that impacts a broad spectrum of people. Because of his effort and commitment, millions of people who might have never stumbled upon the concept of Financial Independence might still be reading off the traditional social script of pursuit of happiness rather than the one he promotes. His script is way more logical.